Hi guys! Today, I'm chatting with my bloggy friend Rachael of Joyful Treasure Hunting. She is probably the thriftiest gal I know, and she is always sharing the most amazing thrifted finds on her blog. Since I made a goal to be more thrifty, I thought it would be fun to chat with Rachael and learn some of her thrifting tips and tricks. This girl really knows her stuff! So, Rachael, how did you get into thrift shopping? Growing up my parents always took us to garage sales, but I just did not care that much about it. I did not have a home of my own to decorate, and I didn't have any idea what my style was. When I got married in 2009 my husband and I did not have very much money. With visions of a beautiful apartment in my head the only way I was going to get my dream apartment was to shop the thrift stores. I was very hesitant at first, but he kept telling me that I could find a ton of cool stuff if I just open my eyes. It did not take long for me to fall in love with the thrill of the hunt, and the amazing deals I was finding. My apartment was constantly changing and all on a small budget. I love it! There are so many great places to thrift (antique stores, the Goodwill, estate and yard sales). Do you have a favorite place to go? My favorite would have to be thrift stores. Specifically small locally owned thrift stores. The larger chain thrift stores have caught on to the fact that thrift store shopping is becoming more trendy and the prices are getting higher, but a small thrift store is where you can find the great deals. Plus most of the money you spend at a local thrift store usually go to a charity or organization you have actually heard of. I like thrift stores because I can go whenever I have free time where as yard sales are usually on the weekends. Now don't get me wrong I still get myself up early on Saturday for a good sale, but I prefer sleeping in and hitting the thrift stores later in the day. Haggling (eeps!)!! I'm terrible at this! Do you haggle on the prices of items? If so, do you have any tips? I will haggle (sometimes) If I feel comfortable with the seller I will ask for a lower price, but if the person intimidates me or if I plain think the price is a good deal I won't say a peep and I will gladly hand over my money. I bought a box of chip board letters recently, and he was asking $5.00 for the whole box. Not a bad price at all, but I knew I only had $4.00 cash in my wallet and maybe enough change in my car to make $5.00. I asked him if he would take $4.00 for it and he said "nope". It happens sometimes so I quickly dashed over to my car and dug out enough change to give him $5.00. Do you go out thrifting with a specific item in mind, or do you just browse and see what grabs your eye while you're looking around? I have found when I have a specific item in mind I leave the store very disappointed because nine out of ten times you won't find your wished for item right away. I try to keep a list on my phone of things I am looking for, but for the most part thrift shopping is more rewarding for me when I go with an open mind and not a shopping list. What are your favorite things to thrift for? PYREX! I love the patterns and the happy colors. I have a large collection that continues to grow, and I am always happy to bring home a new piece. 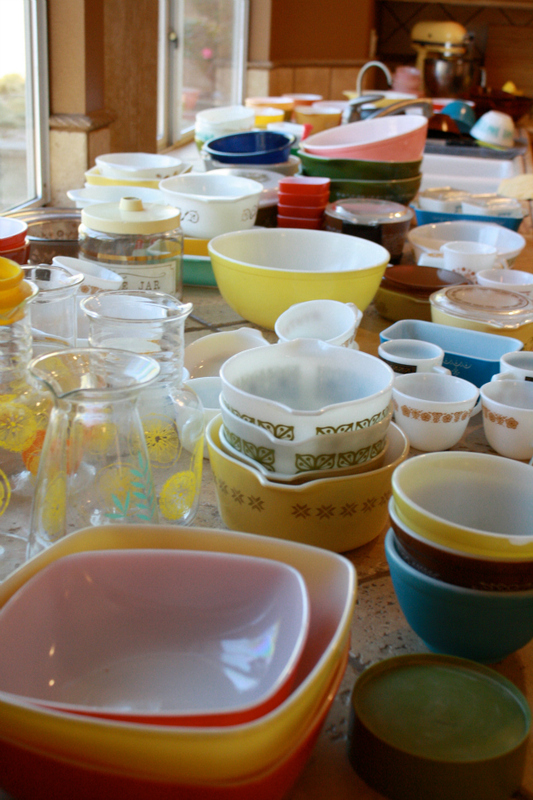 After Pyrex I would say Furniture and then clothes. My wardrobe is 90% thrifted, and I am proud of that fact for sure. I buy wonderful good quality pieces for hardly anything, and that is so much fun for me. Plus my husband really appreciates that I buy second hand. Thanks for chatting, Rachael! It was fun to pick your brain for some thrifting pointers. P.S. Rachael also did a little Q&A with me about my thrifting experiences as a newbie thrifter. You can check it out here. So, do you guys thrift? Do you have any thrifting tips or stories you'd like to share?